We finally did it. We didn’t want to do it, we delayed it, we put it off, we even bought a Subaru instead. But the realities of rural living caught up with us and we finally capitulated to the fact that… we needed to buy a truck. And so, this month, we did. I don’t have anything against trucks except that they’re so BIG and non-fuel efficient and, well, truck-like, which is exactly why we needed it! I won’t keep you in suspense, we bought a 2010 Toyota Tundra for $15,300 and we paid cash. For comparison, a brand new 2018 Tundra, similar to the one we bought, costs circa $37,000. Fear not, all details are below! Also, don’t worry if you hate cars, this’ll still be a fun post to read. I did, after all, once write a post about replacing a storm door that people thought was hilarious, so hey, this at least sounds more interesting than that one did, right?! Longtime readers will be familiar with our car ownership changes over the years, but I’ll give a quick rundown for folks who are new to the journey. 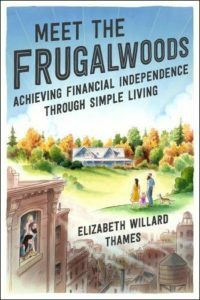 Mr. Frugalwoods and I were carless in the city for many years, which is a great way to save money! The embodied costs of car ownership are pretty high when you consider the purchase price, taxes, registration, plates, annual inspections, parking, gas, insurance, maintence and repairs. Oh my! We remained car-less as long as we felt able to since it is certainly the cheapest way to go. It’s not, however, the most convenient nor is it feasible in most non-urban area. But if you can rock it car-less, DO IT! There are few other ways to save so much cash money on a single line item. Then we had the beloved Frugalwoods-mobile, our 1996 Honda Odyssey minivan, which served us well for a number of years. That car, however, was not suited to rural life in the least as it lacked both things we prize out here: all-wheel drive and good gas mileage. Since we live remotely, a car needs to have at least one of those things in order to be of use. Frugalwoods-mobile was a great city car (ok “great” might be stretching it, but it was just fine). When we moved to the country, however, we quickly realized that the absence of both AWD and good gas mileage made Frugalwoods-mobile suboptimal for our new life. And so, we sold it on Craigslist for $1,000. As anyone who has read my book can attest, Frugalwoods-mobile put in a stellar performance on our driveway the day we closed on our homestead. And by “stellar,” I mean that she got stuck and rolled backwards. Not ideal, in case you’re wondering. More on Frugalwoods-mobile’s life and times here: Ode To An Old Car: Our Money-Saving Machine. 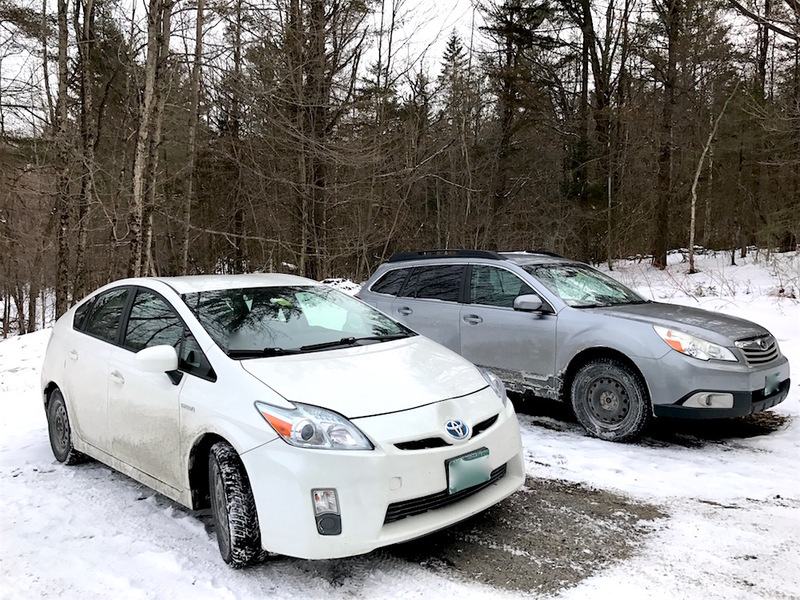 In spring 2016, we replaced Frugalwoods-mobile with a 2010 hybrid Toyota Prius and a 2010 Subaru Outback, both purchased used for cash. 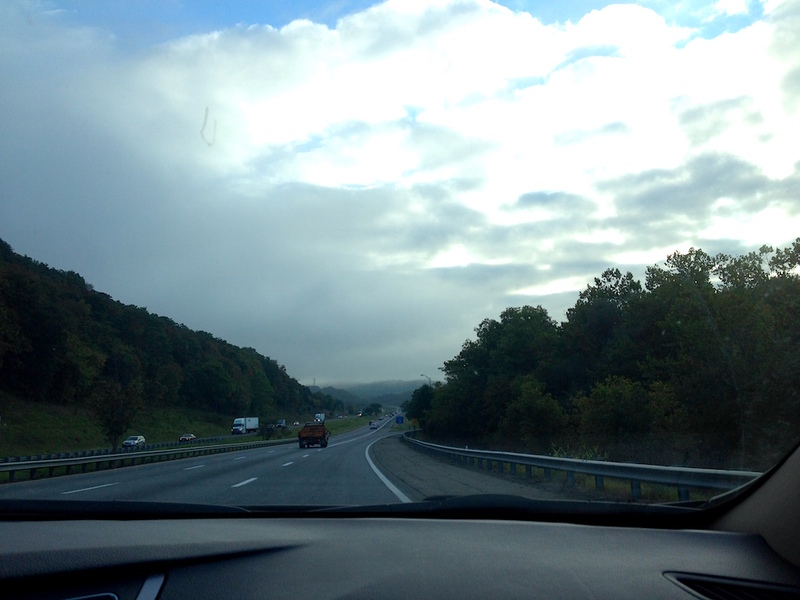 We reasoned that the Prius would achieve our goal of excellent gas mileage and the Subaru our goal of all-wheel drive. As I’ve previously discussed, our rural existence–and inability to walk anywhere and absence of public transit–means that we unfortunately have to be a two-car family. We loved having a single car back in the city, but that was only tenable because we were able to rely on walking, biking, and taking the subway or bus to get around. Out here, however, the only option is to either own a car or to not go anywhere. More on these two cars here: Our Frugal Solution To The All-Wheel Drive Conundrum. We absolutely love our Prius as the gas mileage is outstanding and it has proven to be a reliable little machine. We don’t have daily commutes and we do a lot of things hyper-locally as many of our friends, Babywoods’ preschool, the library, the playground, etc are all within just a few minutes’ drive of our house. However, when we need to go to the grocery store, the doctor, the dentist, etc, our drive time is in the neighborhood of 35-50 minutes each way. Given this, having a fuel-efficient car is a priority to us for the cost savings and also for the decreased environmental impact. A sidenote for parents: I am delighted to report that both car seats fit perfectly well in the backseat of the Prius and I think we are team Prius For Life. 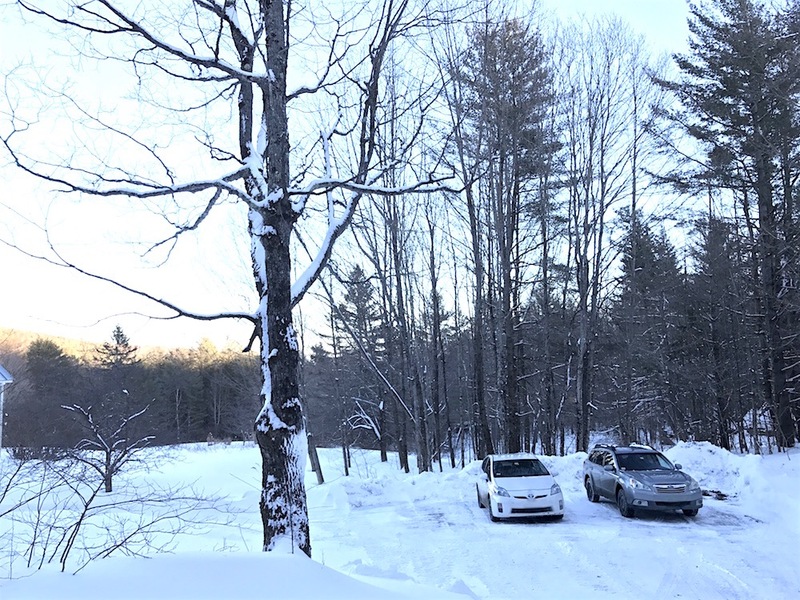 Mr. FW and I have each gotten the Prius stuck on our driveway once this winter (due to icy conditions), which is a good indication to us that we do, in fact, need to own an all-wheel drive vehicle in order to be able to safely and reliably leave our home during the depths of winter. And since winter lasts until, oh, May out here, that’s a pretty significant consideration. Our all-wheel drive solution was the Subaru Outback and, as a car, it works great! No complaints! However, it’s not designed to have the hauling capacity of a truck. Much as we tried, we just couldn’t fit everything in there that we’ve wanted to haul. As I discussed in comparing the costs of living between urban to rural, we’ve found we need a lot of tools, machines, equipment and lumber out here. All of those things take up quite a bit of cargo space in a vehicle. The Subaru has a decent trunk and, with the back seats down, we were able to fit a lot of things in there, but other stuff–such as our wood splitter–required that we borrow a friend’s truck. Mr. FW and I realized we were delaying a huge number of projects around our property because we didn’t have the ability to cart home supplies. We have been able to have a lot of this stuff delivered to us–for a price of course–but that didn’t seem like a viable longterm solution. Several readers asked about a cargo trailer for the Subaru and so I’ve edited this to add that we looked into getting a cargo trailer for the Subaru, but learned that the engine and transmission of the Outback aren’t meant to tow the weights that we need to pull (such as loads of manure, gravel, sand, etc). We also have a fair number of hills out here and apparently that puts a lot of strain on a trailer-pulling Subaru. Plus, we didn’t feel comfortable pulling the trailer in the deep snow and mud that we have much of the year. But, I think it can be a good solution depending on your vehicle and terrain. Another major consideration is the fact that we’ve had to pass up some excellent deals on tools and equipment at garage sales because we have no way to transport the stuff home. Bummer! The list of projects prefaced by “we’ll need a truck first,” was mounting and having our own truck will alleviate the issues related to transporting supplies/materials and will allow Mr. FW to kick off his spring season of projects. Top of the list is building a wood shed and he can now get the lumber home! 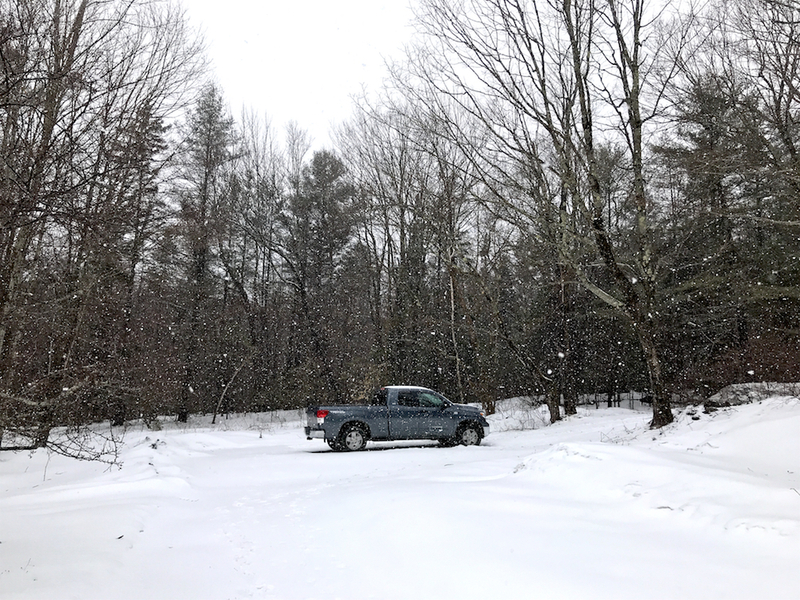 The truck’s other main attribute is that it’s four-wheel drive and so will be able to navigate our driveway and the roads when conditions are either too icy/snowy or muddy for our low-clearance, non-AWD Prius. Why A 2010 Toyota Tundra? When we saw the writing on the wall last year that truck ownership would be in our near future, Mr. FW started a year-long research campaign and landed on the Toyota Tundra. We like Toyotas in general and the Tundra has a good reliability record. We also considered the Toyota Tacoma truck, however, it’s a smaller vehicle and is so wildly popular that used Tacomas are almost the same price as used Tundras! Since Tacomas are smaller, they do get better gas mileage than Tundras, but that’s not our primary consideration with this vehicle. Since we primarily want the truck for its cargo and towing capacity, we decided we wanted the bigger truck (with a bigger bed) since the used prices are about the same. P.S. I took this photo yesterday and yes, it really was snowing!!! In April!! Mr. FW selected a 2010 versus a 2009 (or earlier) because Toyota changed their rust-proofing system for the 2010 models, making them more resistant to rust. Since rust mitigation is a major consideration up here in the Northeast, it was worth it to us to get a 2010 or newer. By keeping an eye on the market, Mr. FW learned that 2010 also seems to be the sweet spot of depreciation vs. value where you’re still getting a relatively new vehicle, but it’s not too expensive. He noted a significant jump in price for 2011 and newer Tundras. We got the 4.6 L V8 smaller engine because we don’t need to tow anything massive and so don’t have a need for the bigger engine. We also selected a Tundra with the smaller double cab as opposed to the larger crew cab, because both of the kids’ car seats fit just fine in the double cab and the bed of the truck is 6.5 feet as opposed to the 5.5 foot bed of the crew cab. Again, with hauling stuff as our primary goal, we wanted the bigger bed. The backseat of the double cab is really quite roomy and a third person will be able to easily sit back there with both car seats. Unless you’re transporting an NBA team, I think it’s plenty spacious. We initially thought we wanted a Tundra with a long bed (which is 8 feet long), but Mr. FW test drove a few and found them to be too huge and unwieldy for his taste. The long bed models also aren’t as common and were more expensive, so we decided that the 6.5 foot bed would suffice. The previous owner had it serviced at a Toyota dealer, so we have a detailed record of its repairs. The service record was important to us because it allowed us to know it was maintained to specifications. Additionally, the previous owner did small things such as apply touch-up paint to dings and dents and dielectric grease on the battery terminals. These little repairs demonstrated that the truck was well looked after. Perhaps most crucially, the frame is in great condition, which is somewhat rare to find in New England. Mr. FW looked at a lot of trucks where everything seemed fine until he looked underneath and saw a horror show of rust. Rust is a truck killer up here and so we wanted something with minimal rust damage. We surmise it’s probably in such good condition because the previous owner regularly washed it and had it undercoated. It also has a spray-on bedliner in the bed, which is a nice touch. Crucially, before buying it, Mr. FW took the truck to our trusted mechanic who put it up on the lift and checked it out. This was $36 extremely well spent! If you’re buying a used car, I highly recommend having your mechanic–separate from the used car dealer or the private seller–take a look at the car before you make your final decision. Our mechanic concurred that the truck was in great shape and appeared to have been owned by someone who took good care of it and knew how to maintain it. Taking it to our mechanic also gave us a great excuse to take the vehicle on an extended test drive and to keep it overnight. 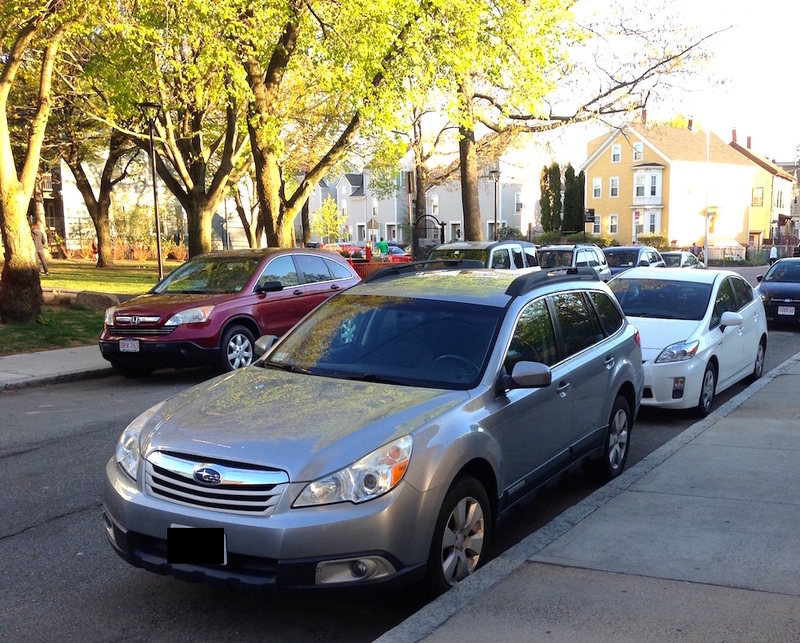 Since we don’t need three cars, we will be selling our 2010 Subaru Outback. It’s such a great car and I hate to see it go, but the high carrying costs (taxes, registration, insurance, maintenance, etc) of having three cars make it impractical. Plus, if we were to hang onto it, it would just continue to depreciate every year and we wouldn’t be able to sell it for as much as we can now. We drove the Subaru relatively little–about 4,000 miles a year–so it’s clear that the Prius is our primary machine. Thus, the new Frugalwoods fleet consists of the smallest and the largest vehicles that Toyota makes. Apt, I think! Also an example of calibrating our car ownership to our precise needs. I don’t want to own any more or any less car than we need to. Since there are so many expenses associated with car ownership, it makes sense to be judicious and thoughtful about the vehicles we own. Most car loans have interest rates, which means you’re spending even more money. A financial triple whammy. Cars lose value the minute–nay, the second–they’re driven off the lot. Hence, you’ve paid a price that you will never, ever recoup (unless it’s a vintage/antique car situation, which is not germane to this conversation). Unlike a home–which sometimes, hopefully increases in value–a car is almost guaranteed to decrease in value. A car is not an appreciating asset. Hence, you’ll never re-sell a new car for anywhere near what you paid for it. A raw deal, to be sure. With a used car, however, since you’re paying a price stripped of the brand new dealer mark-up, you won’t sell it for what you paid for it, but the margin is likely to be much narrower and will help offset the purchase of your next (used) vehicle. As with all major purchases, it pays to know the market. Similar to the many years Mr. FW and I spent researching real estate markets before buying our first home, we spent a fair amount of time–about a year–researching used trucks. The goal of doing this is to put yourself in the position of being able to look at a vehicle and know whether or not its a good deal. You want to have a robust sense of the model year you want, the price that’s reasonable, the common maintenance problems of that make/model, etc. The more you know, the better a negotiator you’ll be and the more likely you are to find a good deal. Craigslist, the holy grail of used stuff, is a great way to familiarize yourself with the market and get a sense of supply and pricing. If at all possible, avoid rushing into a purchase. This isn’t always possible if you’re in a crunch and need a car ASAP. Ideally, you want to test drive a number of different vehicles in the make/model/year you want. This’ll allow you to test your assumptions about both that make/model/year of car and also each individual vehicle. 3) Test out your whole family in the vehicle. Have dogs? Kids? Large iguanas who need transportation? If you can, test out everyone in the vehicle to make sure that all car seats and paraphernalia will fit comfortably. Pro tip: the kids don’t have to be in the car seats, just the seats will do. We did do one test drive in this truck with the whole family, just to make sure we all fit as expected, but the initial research was to have Mr. FW put the car seats in sans kids. 4) Calibrate the car to your needs. If you have six kids, a Prius is not going to fit all of you. If you’re empty nesters, an SUV is probably unnecessary. If you live in the city, you’re going to prioritize a smaller, more efficient vehicle that’s easy to park whereas if you live in the country, you likely need all-wheel drive and cargo space. Know what you need for the stage of life you’re in. The beauty of buying used cars is that, when your lifestyle changes (as ours did), you can sell your previous used car and buy a new-to-you used car without the near-catastrophic loss you’d experience with new cars. Someone recently pointed out to me that when our kids are in high school and we’re transporting the entire soccer team, the Prius might not be large enough. Well, if that’s the case, we shall reassess our car ownership needs at that point in time. No sense in owning a car for your future or past life. Own the car that suits your needs right now. It’s also OK to be wrong with used cars. Since you’re spending less, you have a greater margin for error. We were wrong with the Subaru–we probably should’ve just bought a truck to begin with. 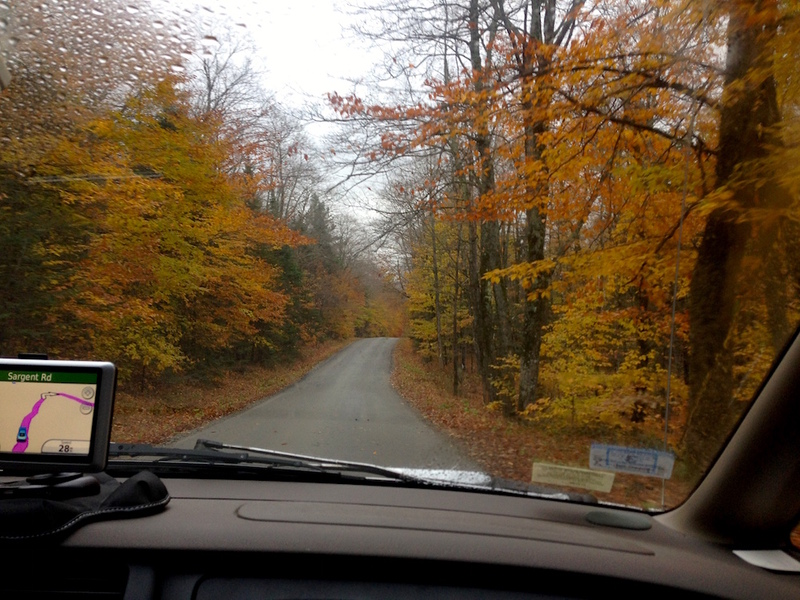 But, we hadn’t lived out here on our homestead yet and we wanted the slightly better gas mileage of the Subaru. However, after testing our needs through two years of rural life, we realize our error. But again, since we bought the Subaru used, we’ll likely be able to sell it for just a few thousand less than we paid for it. 5) Check out both used car dealerships and individual sales. Deals can be found both ways! We ended up getting our truck from a used car lot, although we looked at trucks being sold by individuals as well. This truck just happened to be the best value and in the best condition. One thing we found is that the certified pre-owned vehicles from the Toyota dealership were much more expensive. Here again, you want to know the market so that you’re comfortable with the deal you’re getting, whether it’s from an individual or a used car lot. We also considered the possibility of getting a truck from out-of-state, in particular from the south since rust is less of an issue in warmer climates. Mr. FW checked out Craigslist and e-Bay, but ultimately decided that it wasn’t worth the hassle. 6) Negotiate with the seller. Don’t fear the negotiation! I received tons of questions on how to handle used car negotiations following my initial used car post and my best advice is to know the market. I know I sound like a broken record, but it’s pretty much tactic #1. If at all possible, you want to pay in cash in full for your used car because: 1) it simplifies your negotiations since you’re not negotiating a trade-in or financing terms, 2) financing will saddle you with an interest rate, which is not cool. One of the key goals of frugality is to save for huge purchases like a car so that you can–in the end–spend less overall. It’s a great illustration of the virtuous cycle of frugality: the less you spend, the more you save, and thus the greater the deals you’re able to leverage, which means you spend less… you see where I’m going with this. Of course there is a great deal of privilege associated with having the ability to save up enough to buy a car in cash, and I delve into that topic in greater depth here and here. When you present yourself as an all-cash buyer, the seller is likely more motivated to work with you because they don’t have to go through the hurdles and uncertainties of you securing financing. Make sure to point this out to the seller! I also don’t recommend trading in an existing vehicle because it’s highly likely you’ll get a better deal all around if you buy a used car with cash and then sell your existing car on the private market. Again, by knowing the market, you’ll know what a good deal is both for your new-to-you car and the car you want to offload. 7) Negotiate the “out the door” price, not anything else. Something I learned with buying this truck is that, when you’re paying cash and not trading in an existing vehicle, the only thing you’re negotiating with the seller is what’s called the “out the door price.” Remember the phrase “out the door price” because that is the actual bottom line cost. You don’t want to negotiate the price of the vehicle vs. the “out the door” price. You want to negotiate the bottom line of what you’re going to pay, so make sure to use the words “out the door” price, which is literally the amount you’re going to write a check for and walk out the door with the car. This is particularly relevant when buying from a used car lot. In the negotiations themselves, be confident, be friendly, and be reasonable. For this truck, we knew what the market was and that the truck was priced fairly. But, we also knew that things are always up for negotiation. Even with a fairly priced vehicle, it never hurts to negotiate. You really have nothing to lose. The other great thing with buying a used car is that you can negotiate for repairs to be made, just as you would when buying a house. For our truck, we negotiated that the seller take care of sanding rust off the tailgate and painting it, fixing a small chip in the windshield, and fixing a noise in the blower motor. The original asking price for our truck was $16,800 and Mr. FW was able to negotiate it down to $15,300 (including the aforementioned repairs). 8) Take your time while negotiating and phone a friend. It’s likely the seller will try to rush you through the negotiation process and make you feel like there’s another buyer breathing down your neck. Keep your cool. Discuss the price and the repairs for as long as you want. And then, go outside to phone a friend. During the negotiation for our truck, Mr. FW told the seller several times that he needed to call his wife to talk things over. He then went outside, called me, and we chit-chatted for awhile just to keep the seller in suspense and make them think that perhaps “the wife” was not interested in the vehicle. I was, in fact, very interested in the car and Mr. FW and I didn’t really have anything to discuss, but, it gave him some time to mull things over and let the seller reconsider their offer as well. So whether you call a spouse, a friend, or no one at all, build this breathing room into your negotiations. Even if you don’t need to discuss things with another person, it can’t hurt to have a few minutes to assemble your thoughts while you pretend to talk into your phone ;). 9) Have your mechanic check it out. Take the car to your mechanic–not the seller’s mechanic–and ask them to check the car over. Have them look for any common problems with that make/model/year and also do all general and routine checks like making sure the wipers, heat/AC, windows, and blinkers all work properly. Well worth the cost to ensure you’re getting a good vehicle! Buying your cars used and for cash is a fabulous financial decision as it means you spend less overall (no interest rate, no brand new car mark-up) and also avoid the steep depreciation that all new cars endure. By not having a monthly car payment, you’ll be able to save at a higher rate every month, which means you’ll be able to make your next large purchase also in full and with cash. Never forget the compounding value of frugality! Cars are not status symbols. Cars will not make us feel better about ourselves. Cars will not increase our confidence or make us more popular. Cars are tools to get us from point A to point B. Do not allow yourself to be lulled into the consumer lie that a new, shiny car will bring you happiness and success. Things are not stand-ins for human emotions and the only thing a new car will bring you is a lot less money. Ignore appearances and buy a used car that’s safe, that’s reliable, and that fits your needs. P.S. have no concern for the color of the exterior or the interior. Our Prius was cheaper because it’s white and apparently white is an unpopular color for cars in the Northeast. Bingo! Frugal gold right there my friends. What are your tips for buying a used car? And particularly for negotiating the price? P.S. This month’s Reader Suggestions question is up on the Frugalwoods Facebook page now! Head over there to respond! Help Us Choose The Next Frugalwoods-mobile! I’ve only bought used cars over the years and have had great luck except for once when I bought a lemon. Sounds like you did some great research and are going to be meeting the needs of your family. Congrats on the new purchase and I know the Tundra will treat you well. I should first say I am a big fan of the debt free lifestyle . I just finished watching an interview you gave about your lifestyle that someone posted on Early retirement dot org. The interviewer asked a question essentially saying “you had a great debt free start and good jobs…” you answered “I recognize not everyone’s Frugal lifestyle/journey will be the same”. 1. Dont be apologetic about your success: You had good jobs because you likely studied hard in college and performed well in the job. I went to school for years at night for 2 masters degrees result: appreciation for the debt free lifestyle and financial independence. 2. You had parents that paid or help with college expenses. I didnt but that $5 grand I owed in 1977 was just a small hurdle. My kids will graduate debt free. I am (unfortunately) in a position to be minded daily just how many Americans are on the consumer debt high stress treadmill. The liberating choice to get off that treadmill and reduce stress should be touted unapologetically! Anyway, did you guys ever consider getting a cargo trailer that you could attach to a car to haul stuff? We did indeed look into getting a cargo trailer for the Subaru, but learned that the engine and transmission of the Outback aren’t meant to tow the weights that we need to pull (such as loads of manure, gravel, sand, etc). We have a fair number of hills out here and apparently that also puts a lot of strain on a trailer-pulling Subaru. Plus, we didn’t feel comfortable pulling the trailer in the deep snow and mud that we have much of the year. But, I think it can be a good solution depending on your vehicle and terrain. You are correct about me trying to stop the car with my body–and crazy definitely the right answer ;)!!!! I am in a similar predicament regarding a pickup truck. Echoing Mr Freaky Frugal in that I am considering a smallish utility trailer for the times I need the space. Did you guys ever discuss that as an option while keeping the outback? Good luck with the Tundra; you can’t go wrong with that one! Those kids are so CUTE!!! 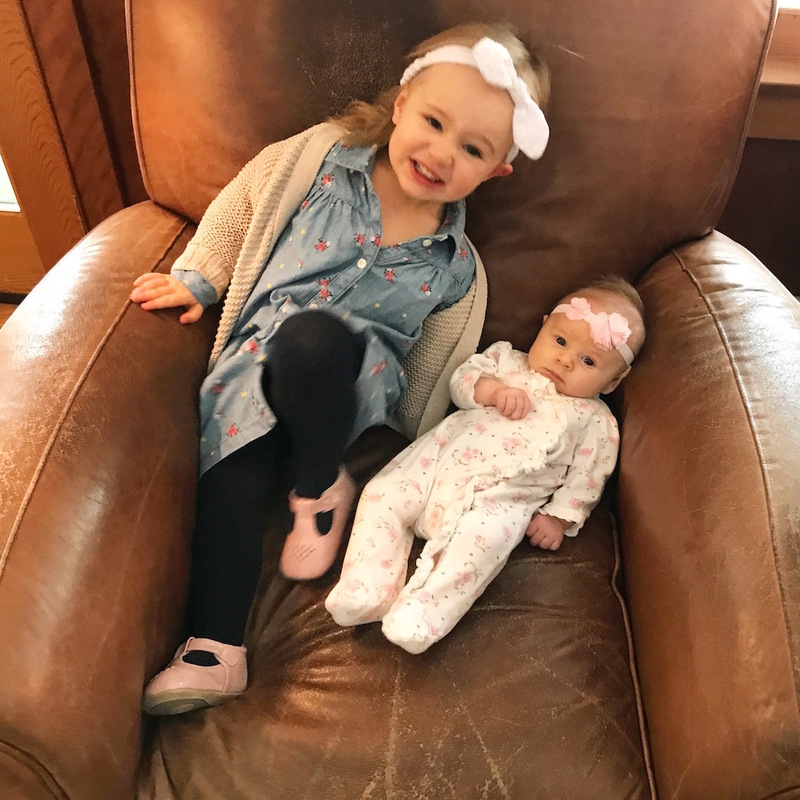 Love big sis on the chair with her little “doll” of a baby sister. I miss that stage, but loving the toddler 4-5 span a lot too. Funny about trucks. A buddy of mine lasted almost 10 years in the country with an old Toyota sedan and an even older Honda Civic. I have no idea how they managed, but luckily their neighbors plowed the drive early enough that no one got stuck (too often.) Only this year did they break down and buy a Ford F150. Sadly, new. You did it right going after a very solid Tundra that’s used and has a lot of life left in her. Never a bad thing to have a truck that’ll serve its intended purpose, instead of what I see here in Minneapolis all the time – shiny new trucks with empty payloads rolling easily down fancy paved streets. Idiots. We bought a used truck in the spring after moving to the country and borrowing a friends on a regular basis for the last two years to haul wood and other necessities. We also just this week heard others with car seats race about their Toyota Prius. My daily driver is about already to need a new home so we’re pretty sure a Prius is going to be the next vehicle because of the gas mileage and it holds two car seats comfortably. Yeah, we are thrilled with how well our family of four fits in the Prius. It’s just the right size for two car seats! Can’t recommend it highly enough (the gas mileage is amazing) :). And the trunk is plenty big to hold a stroller, groceries, etc! Congrats on the new purchase! We are team Toyota all the way. We used to drive a used Toyota Corrola and bought a new one since that old car was nearing the end of its life. We are a one car family. In the future, if we have a third kid, we will buy a minivan. But so far, we just love our fuel efficient Toyota! I have had a Toyota Tundra for the past 7 years. It has held up amazingly well and I would be another in a heartbeat. Good choice! That’s great! I’m so glad to hear it :)! As a fellow Central Vermonter (originally from Southern California) we’ve faced a similar dilemma. We have an AWD Ford Flex, which fits a lot of family and stuff and can easily handle our very long, very steep dirt mountain road and driveway. While we considered a truck for all the reasons you outline, we decided to get a $600 trailer instead and that has been perfect for all our farm needs for the 4 years we’ve had it (and doesn’t require maintenance). Bonus: neighbors can use it any time so it’s become a community resource. You bring up some really great points! It’s funny, I was just telling my husband yesterday how much I can’t stand when people have these giant trucks they drive around and don’t actually need for hauling or towing stuff. We live in Oklahoma, so trucks are EVERYWHERE, and apart from the few people who actually have truck needs, most of them are just status symbols. It’s hard to see past them, and a fair number of them drive really recklessly because they feel impenetrable. So glad to see you buy a truck that you actually need! Makes my heart happy. 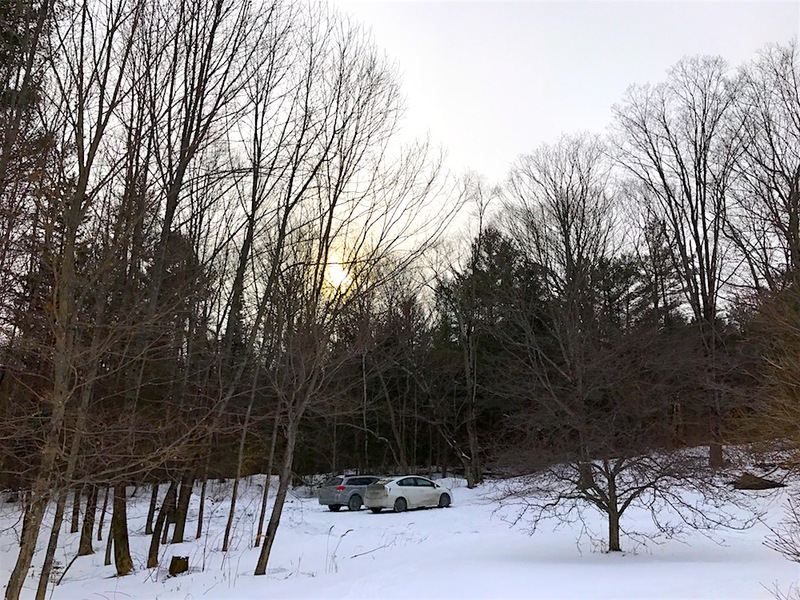 I just wrote a post about our adventures in selling a car this January, so on the opposite ends of things :). You’re definitely right about making more money from a private sale. We thought we’d see what the dealer would offer for a trade-in ($1500). I had done my research on the market and knew that was absurd. We sold it privately for $4,000, mostly using Facebook Marketplace. We could have gotten more from it, but we were kind of ready to move on with our lives. It was a win for us and for the buyer. Thanks for sharing your car selling story–that’s a great illustration of how you can usually do better by selling it on the private market! “Cars are tools to get us from point A to point B. Do not allow yourself to be lulled into the consumer lie that a new, shiny car will bring you happiness and success.“ Yes Ma’am! Nothing wrong with buying a truck when you need a truck. I’ve been driving my 2006 Altima since 2009 so I have not played the buying a used car game lately. I’ll surely be referring back to this post when it’s time for a new to me car though. Enjoy that truck and it’s large bed. We are a loyal Toyota family (currently have a Sienna mini van, Camry and Tacoma truck) all bought used and all paid off. We will never buy a new car. My dad passed away at 77 and never bought a new car in his life-I had a good role model! That’s great!! My parents have a Sienna (and Prius) and really like it! And the first car I bought at 16 was a Camry :). Glad to hear they’ve been good cars for you too. I wouldn’t feel guilty about that purchase, buying the car outright in cash is a great choice and Toyota’s are generally very reliable. I’ve owned two so far. The two little woodsies are looking very cute! Haha, yeah, the answer is that it wasn’t working ;)!!! I enjoyed this post! Eventually my husband and I will be looking for a “new to us” car. We are a family of 4 and our main car is our 2012 toyota sienna. We also have a 2004 Honda Civic my husband uses for commuting to work and that we use for short drives around town. But we do know that eventually we will need to replace that car. I’m just curious to know – because I have been doing some research about buying a car with a credit card (only if you have the cash to pay it back right away) in order to receive the rewards. I know you guys use your credit card for all other purchases so I’m curious to find out if there are reasons you didn’t go this route. I understand, after some research, that not all dealships will accept credit card. I’d love to know your thoughts! Yes, when the time comes to purchase another vehicle, we’d like to put it on the credit card, too (cash in the bank, of course). Any drawbacks/benefits to this? I presume that you researched that possibility! Good question on the credit cards. The used lot we bought from didn’t allow purchased to be made in full on a credit card and, while we could’ve charged part of the truck on a credit card, they charged a fee that would’ve made the points accrued not worth it. So, we just wrote a check for the full amount. That’s interesting…I wonder why that is. The dealership shouldn’t really care one way or another how a person makes a purchase. Wonder if it’s the same here in Canada. Guess I’ll find out one day! Dealer is charged 2 to 3 percent if you use a credit card. That could be most of their profit margin. If you don’t “know” cars/trucks don’t be too prideful to get an experienced friend to do your shopping. Thankfully, I worked for years with an older gentleman who was wise in car ways. But pay attention and learn so you can do it yourself some day. Don’t let the process intimidate you. (I saw your lane, Liz, and thought: Truck!!) Well done! On really bad winter roads you will feel much more safe…especially with your precious cargo…love the baby pics!! We have a used truck (1997) and it has been a fabulous choice for our family. Full back seat so we can all fit, plus we camp in it year round. And my husband uses it as a work truck. There’s a lot of blowback for trucks in the FI community, but there is also a lot of reason for them (if you aren’t just using them as your commuter). Yeah, I think it’s all about calibrating your car ownership to what you truly need. We tried for two years to get by without a truck out here in the country and finally conceded to the fact that we need one :). Glad to hear your old truck is still trucking! You’re right that there’s plenty of blow-back regarding trucks in the frugal blogging community. Most of it probably MMM-inspired. I used to be of the same persuasion myself until empirical evidence dictated otherwise. We used to drive two fuel-efficient hatchbacks (Pontiac Vibe & Chevy Aveo LS) and kept my old ’91 Chevy S10 4×4 reserved for hunting season and snow-breaking duties in winter. But my limited daily commute to work (6 mile round trip) meant that the cost of vehicle registration alone on the truck was more than the annual fuel savings of driving the Aveo instead. This didn’t count the hassle of putting insurance on the truck prior to driving it, or the issues associated with having a vehicle sit unused for periods of time (low battery, brakes seizing, etc.). For our situation, it was actually more economical to downsize to only two vehicles, trading down from a fuel-efficient hatchback and making the truck a daily driver. Hard to believe, but true. Now I can quit thinking “why don’t they own a truck? !” Our 13 year old truck is on limited time and we will have to move up to a crew cab next due to being a family of very tall people. I’m researching now for when the inevitable happens. For our cars we’ve found new prices to be barely different from used- so we buy new and drive them for at least 15 years. The used market here must just not be that great, or the cars we are looking at are inexpensive to begin with. Looking at the photos though- how do you keep the snow cleared from your cars when you park outside? I’ve never seen such cleaned cars in the winter! I found the same thing when I was looking for a car! Glad it’s not just me. I bought my Sienna new in 2005 and I’m planning on replacing it with a new car when my youngest has been driving for a year (soon!). It has over 200,000 miles on it and now needs to have the wheel bearings replaced. Otherwise it’s been a great vehicle, and I think that in terms of cost per use it probably worked out similar to buying used. We have just listed one of our cars to sell and I’m so excited that we will be a one car family again! We live just outisde of a city, so its a 2-10 mile bike ride to everything. But this winter we decided to build an e bike to hopefully drive less, and it has worked well. We are fortunate that many of our friends own trucks, so when we need one we can borrow one (we just fill up the tank with gas). Sometimes that does mean missing a great craigslist find. But, out on the homestead it makes sense that a truck was necessary! I heard Tundras are a great choice. I have had my Taurus wagon for 26 years. He drove from NY to Oregon to Boston back there! Yes! But, with the two carseats in the back, a dog wouldn’t fit in either the Subaru or the Prius. So, a dog would be traveling in the backseat of the truck, next to the car seats. We’re lucky that our vet is very close by, so if/when we do have another dog it wouldn’t be too far to drive with the truck. Liz, I haven’t replied in a while but I do still follow your blog with enthusiasm. 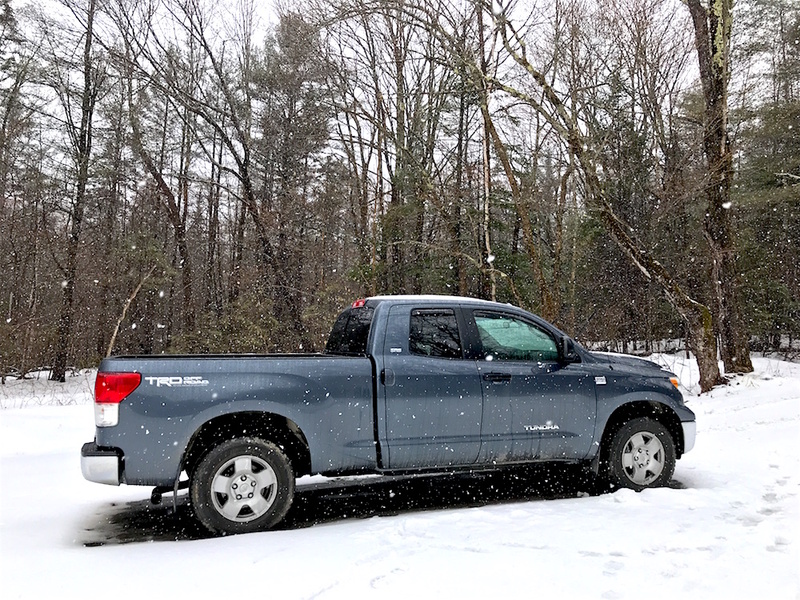 You may remember that we are also Vermonters, and we have owned two different Toyota Tundras, the first around the same year as yours, the second a bit later. Our first one was the larger cab and we loved that truck. I mean loved that truck. We went everywhere in it. We made a big mistake when we sold it. Our driveway and private road is similar to your driveway, and that truck took us through everything, hauled anything and everything. We also had the spray-in bed liner and we put on a Tonneau cover (sp??) because my husband wanted to keep things dry while in the bed. I highly recommend the bed liner because it keeps the bed from rusting as you drag stuff in and out of it and scratching the paint. I smiled when I read this post because I knew it was only a matter of time for you. But you did admit your error and I applaud you for that. I understand the need for mileage considerations, but sometimes you just have to bite the bullet and do what needs to be done…and you still did it thoughtfully and frugally. Good for you. I hope you enjoy your new truck for many years to come, and it brings you the peace of mind you need to get around while living in beautiful, but sometimes ornery, Vermont. Thank you, Bev! I always love hearing your Vermont stories! And glad to hear you’ve enjoyed Tundras too. Fortunately, ours has a spray-on bedliner already, which is great! While I am sure you got an awesome car, I also suggest to people to not be afraid to not get the big-name brand vehicle. My mom used to work in short-term auto auction financing (dealers buying used cars at dealer-only auctions with 90-120 day loans) so she would often speak with dealers about cars they were buying. Sometimes cars would surprise you with reliability and didn’t have a Toyota or Honda on the front, which can often add a 5, 10 or even 20% premium over another brand vehicle (she had a dealer who specifically bought and resold Mitsubishis and was able to get great deals on them all the time). Like another commenter says, get someone who knows cars to help you with the search if you don’t know where to start. And always search the internet for reviews on the specific year/make/model of the car you’re looking for to make sure you don’t end up with a bad model year with issues, although depending on the issues and what you need the vehicle for (is it commuting or just hauling stuff locally? ), that issue can be something in your favor if you use the possible defect to bring down the car in price enough so that you can afford to deal with the problems if they arise down the road. Also, I don’t trust buying cars from a personal seller personally, especially for that much amount of cash, so I am curious if anyone on here has handed that much in payment over to a person for a car. (I’ve only purchased used from dealerships). Maybe you can post a PS or another article down the road with stories from a few people from different states on how people buy cars used from individuals? Like do you use a notary? Handle the process in a bank? Use an escrow service? I’m always a little worried about business exchanges for that much cash/cashier’s checks. 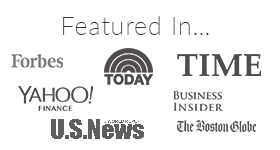 Tara – I would recommend getting a bank check and/or doing the transaction at the bank. I make sure they have a clean title and you can ask your insurance agent to do a lien search for you. The most I’ve bought a car private party was $3K but my sister sold her’s private party with no issues! Good points and great questions! Rules around buying from an individual vary by state, but a lot of the paperwork can be downloaded online (Google “private auto transaction + your state) and often, you’ll go to the purchaser’s bank and then get a cashier’s check to pay the seller. And the reason to go to the bank is to ensure you’re not getting a counterfeit cashier’s check–you want to see the bank teller make out the check. I love your idea of having readers submit their stories!! Go to your bank and do the transaction there with a witness. There are usually cameras too. I’ve bought and sold at least a dozen cars privately. Out of all the cars I’ve owned (all used) only 1 was bought from a dealer. I have a ’08 sonata with 110k that I bought for $4,000. And a ’93 F350 with 106k that I bought for $5,000. I’m so happy to hear that your husband approves of Tundras! Good to know :)! We have TWO Outbacks: 2012 and 2016. Prior to buying these two new cars, we had bought exactly four new cars (each going about 200k miles) and a smattering of used cars in 45 years of marriage. Not bad. One new car for two people every 11 years. But, you’re exactly right: sometimes you need a TRUCK! 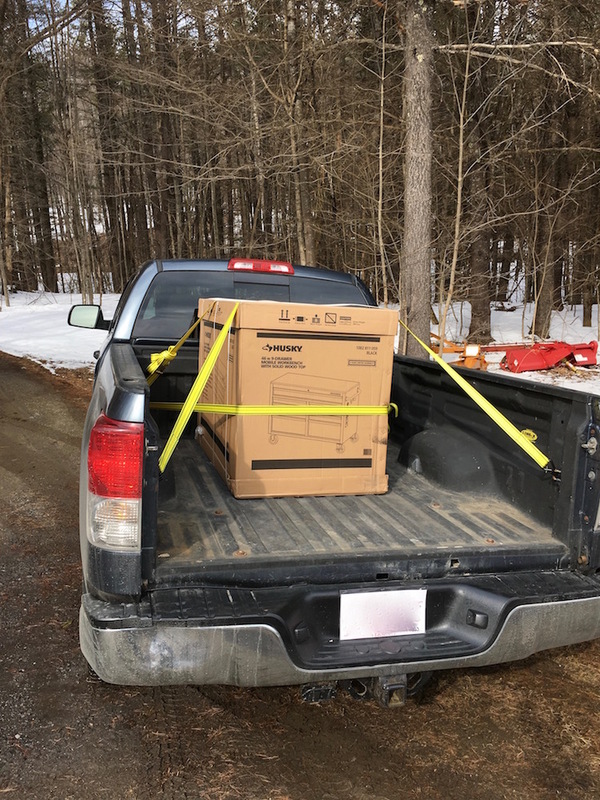 We live in Northern Vermont and, well, even today I need a truck. My snowblower needs welding and I can’t get it in my Outback. A decade or two ago I got this idea of a “neighborhood carpool share”. There would be some shared vehicles: a pickup truck, a van, maybe something else I can’t think of right now (a small tractor?). But I couldn’t figure out how to work out the details. Oh, well. Maybe a thought experiment. I love the idea of a neighborhood truck! Would make so much sense! Can you elaborate a little more on how you convinced the seller to take the truck overnight and to a mechanic? I would imagine some sellers would balk at that request without some sort of collateral. How would you handle any pushback if they said no but you really like the truck? Great question! It’s actually not an uncommon thing for used car lots to let you do. They have a form for you to fill out, they make a copy of your driver’s license, and you leave your current car with them while you take the car you’re considering buying. For a private seller, I can imagine it might be tougher, but I would suggest asking the seller to drive it to your mechanic’s and have them meet you there. For some private sellers, I imagine you might be able to follow the same format as used car lots utilize. I only buy used cars as well, and I’m a big Subaru fan. I had my last Subaru for 8? years until a tree fell on it….that was a bad, bad day! I bought another Subaru and thankfully I now have a garage to keep it in, so no more tree damage! We also live in a rural area so we combine errands to keep gas consumption and mileage as low as possible. Love your blog! A tree! Oh no! That’s one of our fears out here ;)! I’m the car buyer in the family and have purchased over ten used and one new. My key is to have cash and be willing to walk away. I love your idea of making the phone call to keep them guessing. When we bought our new car eleven yrs ago I was using the out the door lingo you suggested. When it came down to final signatures they tried slipping in a $300 transportation fee on top of my out the door agreement. It was comical watching them trying to justify it to which I sat there calmly knowing I would walk. It took them a total of five minutes to reprint the final contract. Nicely done, Linda! Congrats on getting so many good deals over the years :)! My disdain for truck ownership only extends to the office workers that have them and never use them for truck-like things. As you said in one of the comments above, matching your car ownership to your practical needs is key, and as always you guys amaze me with your research and due diligence into all things financial. Great post! If I may add one thing about finding used cars, using online dealerships like Carvana is a good other place to check. They don’t include dealer fees in their price, and they deliver it to you. You can “Test own” it for 7 days and if you don’t like it you can return / exchange it. They don’t negotiate their prices, which is not great, but the total price is always much lower than the dealership in my research. I’m still on the fence about used vs new. I was recently looking into having to buy a car (transmission problems in my current car) and found the used market to be disappointing. I was looking for something with relatively low mileage, 50k at most, ideally closer to 30k. The reason I was looking for this mileage range is because I am still at a phase in life where I put moderate miles on a car, around 10k a year, more some years. When I buy a car, I want to be able to drive that car for 10-15 years. This is just my personal preference of not enjoying the car buying process. The cars I looked at in this mileage range ended up being only a couple grand less than a new (base model) vehicle. I think this is largely because the used cars being sold weren’t base model cars. They were upgraded versions and had features I just wasn’t interested in paying for. For a couple grand more, it seemed worth it to me to have a new car, from the standpoint of getting a few more years of driving out of it. This was just my experience, I didn’t end up purchasing a car. That being said, I’m very open to getting a used car. I think there are good deals out there they just need to be found. Also if you are in a position to get a higher mileage vehicle and can get a low price on it, great! But I do think people need to do their homework when shopping for a car, and not just assume used is automatically better. Figure out what is right for you. If I may. The sweet spot for depreciation (my experience) is at 75-100k. Modern cars routinely make it 200k (yes even Chevy or Ford) if you take care of them. So even at 10k miles a year that is still 7-10 years of use. As an example. I bought a ’97 Subaru gt wagon for $2200 with 110k miles in 2010. I sold it in 2016 for $2000. So I only lost $200 in that time. I did spend $2000 on non routine maintenance in that time but over 6 years that’s < $40/month in depreciation + maintenance. The rest of the cost was gas, insurance, oil changes, one set of brakes, and one set of tires. Things you are going to do for any vehicle you drive 5+ years with lots of use. Plus these things are much cheaper on an older vehicle than a new or like new one. I have zero clues about car ownership as we are currently doing your city-phrase where you didn’t need a car. It really is a great way to save money in the city if the environment called for it! We’re basically holding off and waiting on driverless cars. It might be a while or it may not but we have probably 10 more years of city living. C’mon science!!! I’m not surprised that white is an unpopular car color, it’s very hard to hide dirt and grim! Great choice on with the Tundra! I have several friends who only buy Toyota trucks. I myself have an 1999 F250 but that’s just the best deal I could find at the time, I’m not flying a Ford flag or anything haha. Trucks sure are handy for DIY, I am sure Mr. Frugalwoods will love the level of convenience it adds to his projects . Thanks for all of the used car purchasing tips and another great post! Congrats on finding a good truck for y’all! I realize this is probably a moot point now since you’re selling your Subaru, but what did you do for your carseat situation when you needed to switch between cars? Did you own multiple carseats so that you didn’t have to do the transfer between cars? Or, for your infant carrier, multiple bases? Or are you just superwoman and good at transferring those massive toddler carseats from car to car by yourself (which is more than I can say for myself)? A good question and not a moot point since we will be toggling between the Prius and the truck. We have two sets of car seats, which makes life SO much easier. We received two toddler carseats as hand-me-downs and bought a second base for the infant bucket–very worth it in my book! I love how you know what you want and wait until you find exactly what you want to purchase it. We are a large family (7 kids) and I have a home daycare so we own a 15 passenger van. Not the most glamorous vehicle, but necessary! I contacted a trusted salesman at a dealership and gave him the parameters to look for and he found exactly what I wanted in about 4 months. And I mean he found exactly what I wanted, a 15 passenger van with less than 100k miles, with all the maintenance records and from a small Christian school for less than $9k. It’s still running strong 10 years later with almost 200k on it! I currently have him looking for the same vehicle, a gmc savanna, a few years newer with less than 100k miles on it. There are some issues coming up with our current van and I don’t want to be in a hurry to get something when it finally dies. At this point the van itself is worth less than the new tires on it so I want a new(used) van like our current one so that we can use the tires and any other parts we may ever need. I highly value this salesman because we live so rural (central SD) and he has contacts in lots of dealerships in surrounding states. Liz, do you think you could get two car seats and a booster in the back of the Prius? We are a one-car family with a Mazda 5, which we really like, but I think down the road we will be switching to a combination of larger minivan and smaller fuel-efficient car. That’s a great question and I’m not sure. Hopefully another reader has tried it! There certainly is a middle seat, but I’m not sure if you could squeeze a booster in there. You could always go test drive a Prius and see if you’re able to install all three seats. Also, I know that there are certain brands of carseats that are narrower than others, so perhaps three narrow seats would work. Good luck–it’s a great car! It depends on the seats! When we had our third child, everyone thought we would get a van or large SUV but after a few hours of internet surfing, we learned a great deal about 3 across seating. There are radian car seats that fit 3 across in almost any vehicle but they were quite expensive and we already owned a bunch of car seats. Since our oldest just needed a booster seat, our research pointed us to the bubble bum which is a 13 inch wide booster seat. It is inflatable and portable but has excellent safety ratings. We used it to go three across in our Subaru Legacy with an infant and toddler seat. Now that our kids are a little bigger, we still use it to go three across in the legacy and also in our newer purchase, a Honda Civic hybrid. We purchased 2 of them 4 years ago and one of them is still going strong. As a bonus, if you are flying somewhere and renting a car, they are amazing for traveling and weight less than a pound. I LOVE my Mazda 5. So sad they quit making it. I just bought a 2015 Mazda 5 and I love it too!! When I started researching I was kind of bummed they no longer make it and I got lucky and found a great deal on one–I think a lot of other people love them too and hold on to them because there aren’t a lot of them on the used market! For me it’s the perfect combination of small minivan/very small SUV that makes great use of space and is very flexible. Would you be willing to share what you keep in your savings account or what you feel “comfortable” having in there? You 2 got a screaming deal on the truck. I checked our local Carmax just for grins. Their cheapest 2010 had 77K miles and was a whopping $23,599!!!! I am looking for a new-to-me car too. I simply need more gas mileage and less miles on the car. So thanks for all the great tips. We bought ours on December 31st and were very vocal about coming back the next day if needed. The salesman, who wanted a higher commission (it’s tied to how many deals they close per month) and the dealer, who wanted that model off of his floor to make room for the next years model were both very eager to close THAT DAY. First of all, that photo of the ‘Woods kiddos is KILLING ME – could they be any cuter?! Second, I learned the hard way in my mid 20s what an idiotic investment a new car was . I got my latest car before discovering FI/RE, but I’m still pretty proud of the deal. It was a 3-year-old (2012), certified, pre-owned Acura TSX from the dealership that only had 20k miles, and the out the door price was 20k. Not just working heat, but heated seats! What! Plus they gave me 1k for my junker trade-in. I got a 1.5% interest rate, but paid it off in a year so that I could call myself officially debt-free. I don’t drive much, and plan on running it into the ground, so hopefully it’ll last a good long while and truly prove to be a great deal. If you ever find this comment (I seem to get your blog late – already 53 comments), I want to thank you! I need a new truck and didn’t know where to begin. What you have written is so helpful! I know exactly what I’m doing now! Thank YOU! We sold our second car almost two years ago. We have a 2014 Corolla that we paid cash for that suites us just fine. It’s reliable, has a cavernous trunk and gets great gas mileage. We try to use alternate forms of transportation (walking, bicycle and bus) as much as possible to keep mileage and fuel costs down. As a plus – we get lot’s of exercise along the way. 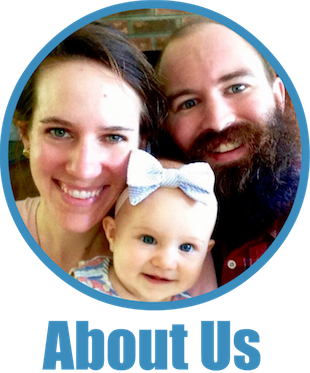 At first we were nervous about making one car work with two adult schedules and two kids at home, but with a little organization and adjustment, it’s been really simple. At some point, we plan to move to a different kind of property and a truck will be necessary for us too, but for the next few years, our set up is perfect. We calculated a savings of $3000 every year from not having a second car, a savings we are investing instead. That adds up quickly! Since transportation is one of the top three expenditures, it’s worth thinking about alternatives. So glad we did! Congrats on the truck! I’m driving an elderly Odyssey right now and I hope to make it last as long as possible. Thank you! Good luck with your Odyssey–we really loved ours. We found a car we wanted a little above what we were willing to pay. We went to make the purchase later in the day. The seller was more motivated to give us a better deal and negotiate because it was getting late and they wanted to get rid of us. And make sure you are willing to walk away from the deal if it is not what you want. Many times, this will make the seller drop the price to keep you from leaving without buying. Also, when buying a used car, don’t forget to calculate taxes you will have to pay based on the value of the car, not what you pay for it. You may buy a used car for $1 but the taxes will be based on the $10,000 value of the car. Check for the law in your state. In Georgia, you have to pay that all up front when you get your tags. I think the best tip for any purchase negotiation is that you really need to be able to walk away from the purchase. I bought a 10-year-old, very low-mileage used Corolla from a local dealer 2 years ago. I don’t drive a lot and mostly bike to work but needed a car for some things. I had my bottom line price, developed after much research, and was prepared to walk away. I was amazed that the dealer said yes. We paid cash and it *was* the cheapest car on the lot, maybe they just wanted it off the lot. But yes, I was ready to walk out the door. Good point! Thank you for sharing! Congratulations on getting a car that adds value to your lives. I can’t wait to read about all the new projects (no pressure!). Something I would add to the used car buying process: Know the rules and regulations in your state. We bought a car fresh after moving to NY state and had no understanding of the inspection process here. The dealership sold us a lemon, and we were naive enough to take it. Now, we take the car through inspection PRIOR to purchase, even if it just had an inspection a few months ago. Welcome to the truck club! I’ve driven a truck since college and I’m not even sure I remember how to park a regular car. I drive a huge 3500 diesel dually now, it basically handles like a school bus, but I love it. I pretty much work part time helping friends move, but I don’t mind. Also Babywoods looks so grown up next to her little sister, that photo is precious! Congrats on your new vehicle! All of my cars except for one (which I drove until it died) have been used including my current vehicle which is another Toyota Camry which I scored with only 3K miles on it and it was over a year since it was first purchased! The best way to go financially, hands down! You definitely needed a truck in your situation. The Frugalbabies are adorable! So great! We also have the smallest and largest possible vehicles… a Leaf for efficiency and environment (purchased new, but with fantastic tax incentives… it costs $1 to go about 100 miles, and there are no moving parts!) and a one ton van for hauling ($1000). 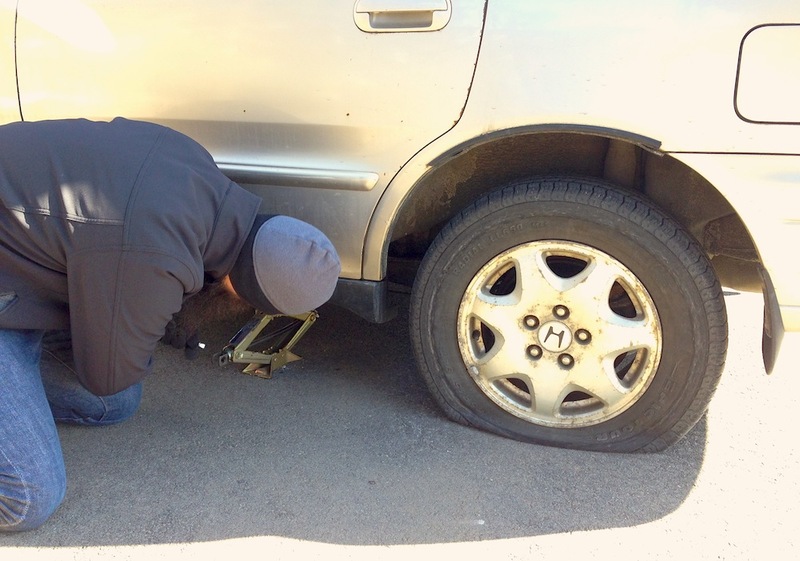 So grateful that my husband knows cars so well… his skills and knowledge have saved us thousands over the years! I wondered how long you’d last without a truck! They’re very useful in the country. I’m going to have to make a decision soon about a bigger car and am dreading it. My current car isn’t paid off yet! Any advice for this situation? I definitely do not have the savings to buy anything with cash. I love every aspect of this post, even though it took me 3 sessions to read it all during work breaks. You have inspired me to write my own lengthy car-buying post on how hubby and I paid cash for a new SUV for less than dealer cost (thereby removing the costly markup from the equation) via a combination of cash-only and brutal negotiating tactics! Enjoy your posts as always, great insights. I honestly don’t know how people “keep house” without owning a pick-up truck. It is just so darn practical!!!! I will never buy a new vehicle. Why lose all that money in depreciation? We purchase our vehicles from a lot that specializes in lease turn-ins. Most are three years old and right around 30,000 miles. Our latest purchase is a 2014 Buick Regal turbo with only 9,000 miles that we scooped up for $16,000. That’s less than half of the original sticker, and the car is in pristine condition. There are dealers in nearly every region that specialize in leased car sales. A little research and legwork can find you an awesome deal. Something we learned as long time Alaskans, is on bad roads, you need weight in the back of the truck for it to handle properly. My husband filled a couple of large bags with sand which he tosses into the back during the winter. If he did get stuck, which he hasnt, he has sand on hand. We think it’s a main reason his truck has never joined other trucks in the ditch on icy roads. Good to know! Thank you! Can’t hurt to have that sand on hand anyway :). You claim you own the largest & smallest of the Toyota fleet. Yes the Tundra is the largest (along with the Sequoia SUVJ, but I believe the Toyota Yaris hatchback is smaller then the Toyota Prius. Either way you have 2 vehicles from one of the best automotive builders in the world & they last forever of properly maintained. Good choice! Yes! We do that! It’s just that our driveway is way too long (a quarter mile) for us to do the whole thing. But ashes are excellent for traction. What do you suggest for checking out a vehicle located some distance from you? If a vehicle is 200 miles away you can’t have your mechanic check it out. I’ve driven both new and used cars and so appreciate the used car lifestyle now. The actual searching and buying duties belong to my husband who loves it, and he let me share his top tips a couple years ago (http://agaishanlife.com/2016/07/your-take-buy-used-or-new-cars/). We’re currently considering whether the cars that we drive now still suit our family that’s grown by one member, and may be embarking on the search for a replacement car soon. One reason we’re not quite ready to commit is that we’ve put a fair bit of maintenance money into our latest car (2 years old with us, but it’s an early 2000 car) so it should run great for at least a decade and it’s a bit of wrench to sell that off to someone else who won’t value that kind of maintenance as highly. One point I’d like to make related to reviewing maintenance record. I know you mentioned things likely done by the previous owner himself, as well as the records from the dealer maintenance. I used to think that dealer maintenance was the gold standard, but in the last few years, I’ve found independently owned garages that I trust, and have begun to use those as opposed to dealer owned service shops. I’ve experienced good customer service, excellent maintenance on my cars, and save money. I found that not all the factory recommended service is really necessary, and in fact, service is often a bigger profit center for dealerships, especially given the pressure on margins faced by the sales floor. Great point! We actually never go to the dealer for service (unless it’s something covered under a recall, etc) since they charge so much more. We’ve always used independent, local mechanics and been very happy with the service. For us, it was just a case of having easy access to this truck’s service record. But, you are very right that one shouldn’t discount a used car that’s been serviced elsewhere! Being quite familiar with rural living, I KNEW you would end up buying a truck. Looks like a good truck for a good price! 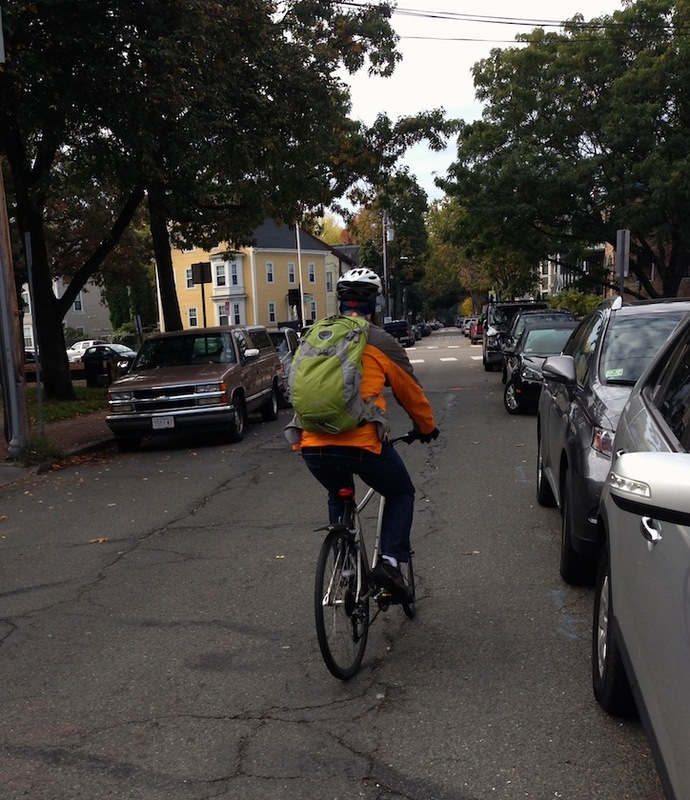 If some of the local stuff is a few minutes away by car, what about biking instead? It would be fun to bike with the kids sometimes instead of relying on the car for everything. I know rural roads can make that hard though. That would be ideal–and it’s what we did back in the city. But, we live on a state highway and I just wouldn’t feel comfortable biking on it with the kids while cars are whizzing past at 60 mph. The ability to walk and bike places is something I really miss about the city! why not just get a hitch and teailer for the outback? We looked into getting a trailer for the Subaru, but learned that the engine and transmission of the Outback aren’t meant to tow the weights that we need to pull (such as loads of manure, gravel, sand, etc). We have a fair number of hills out here and apparently that also puts a lot of strain on a trailer-pulling Subaru. Plus, we didn’t feel comfortable pulling the trailer in the deep snow and mud that we have much of the year. But, I think it can be a good solution depending on your vehicle and terrain. We went and drove a 2014 Acadia and I absolutely fell in love with it, but it was still over $25,000. Just to much for me to even consider. So we just happened to look online and see one that had been listed that day for the 2010 for $15, 000. It only had 69,000. We were there the next morning to test drive and brought it home that afternoon! I think that even if I ever won the lottery I would still get a used car…I just can’t take losing rhat much value the moment you sign the papers! Have you ever heard of the British TV show Top Gear? In one fantastic episode, they drove a modified Tundra to the North Pole. So if a Tundra can manage that feat, your driveway should be no problem at all! Welcome to rural living! A truck is a must have for many rural people. As far as buying a used vehicle, it’s one of the wisest financial decisions you can make IF you can find a well tended item. We had a Nissan Frontier that we used with a trailer and it could pull almost anything. Stopping while under a load was another matter. Once it started to get long in the tooth, we were lucky enough to buy an almost immaculate 2012 F-150 crew cab for many thousands under what a new one costs. It still has under 50K miles and Is a light year beyond the old 4-banger Nissan. Which got handed down to my son,btw. Good luck with the Tundra! It always amazes me to see how giant your trucks are in the US! An Aussie sized “ute” would have been a great compromise for you. Much better fuel economy! I loooooove my My 2001 Toyota hilux it was 9k a few years ago (cars are expensive in Australia and toyotas really hold their value) I added a canopy (think maybe you call them toppers over there?) which I scored on eBay for about $60 so the dog can go in there after adventures. The gas mileage is way better than the tundra no doubt but not as good as my last car. I don’t mind the mileage though as I work from home and always challenge myself to use only one tank of gas a month so around $80. The dog, the camping, the safety (pesky kangaroos! ), the hauling meant I needed the truck. Country living without a 4wd truck is horribly incovenient. My preference is a 4 cylinder Jeep and a utility trailer. The Jeep is fairly fuel efficient, tough enough to handle a pretty heavy trailer, and a lot of fun minus the trailer. I did almost exactly the reverse but my thinking was very much in line with yours. I recently sold my 2010 Honda Insight and purchased a 2015 Outback. Like you found, a hybrid is a great car for distance driving but not great for hauling stuff. I have had trucks in the past and they are hard to park and gas hogs. The Outback, with a small trailer, should meet my needs of a single-dad with a newly acquired “value priced” home close to work with two dogs. I only live a few miles from work now but the elevation change is well over 500 feet and PA winters with hills are far easier on my nerves with AWD. Think about what you need then do the deed. I think you’ll like the truck. I had one and it performed what I needed it to do at the time. As a fellow Prius owner (and actually as a fellow 2010 white Prius ower), I have to say it has the best gas mileage of all Toyotas but isn’t the smallest! Interior is actually a little rommier than a corolla and definitely bigger than a Yaris. 2 6′ adults can sit pretty comfortably in the backseat. So true! There is a misconception that the backseat is tiny, but we’ve found it’s just fine for adults (or for two car seats). I was wrong in saying that we own the biggest and the smallest–so I should really say “almost the smallest” ;). Glad you’re loving your Prius! It snowed down here in Massachusetts this week as well. I never thought I would watch a track meet in the snow. This has been one long winter. Congrats on the new truck. I’m more of a utility trailer person myself (and have no qualms about borrowing a truck when necessary)… but that new truck is a beaut! I have a 2002 Tundra and love it. I got it when it was about 6 months old and it was a good deal, though perhaps I would have negotiated better had I not limped onto the lot with a station wagon whose engine had just blown with a hole in the windshield from trying to haul lumber. No regrets, though. And now when I take it in and it needs repairs, I frequently ask my mechanics to tell me when I’m approaching the end of its life so that I can plan accordingly. So far, so good. I hope my car lasts forever, I don't want to go through the car buying process anytime soon. And do sell the old car right away. A friend got a third car when her mother died. The car was a low mileage three year old cream puff, but my friend didn’t need a third car. I offered to sell the car for half of what the seller paid–having decided via local Craigslist that the car would go for about 4K. Nope, she said she wanted more for it. So she let it sit in her driveway for four years and then gave it to CarMax for $500. I felt very dogmatic about certain issues when I lived in the city and wanted to move to country to homestead. After living out here in the timber for seven years, I feel the biggest learning curve was not the physical labor so much as the mindset. City life and country life are just two different lifestyles. No reasonable country person would ever question your decision for a truck, even if some use compact cars and trailers (though I have never personally seen that). A Corolla and a trailer would be inoperable on our country roads from March-May. In addition to how we spend our time (gardening, chopping wood, felling trees, drinking iced tea on the back deck), consumer choices can be stark also. What I have learned in 7 years is that the two lifetyles don’t always marry well, and a dying off of one, replaced by the other is exceptionally helpful. Fantastic post! This is so helpful to so many. We have always done a lot of research, bought used, and have been extremely fortunate with the usefulness and longevity of our vehicles. We literally drive them into the ground. Another option, is to buy end of the year clearance on a vehicle that no one wants. We picked up a 2011 Ford Fusion in the summer of 2011 for $8,000 off the sticker price. It had a six speed manual transmission, it was the only one left in the state of California, and no one wanted it. We purchased it for $18,000 and the car did not begin to depreciate for about 2 1/2 years after purchase. It is the only new car that we have ever owned. However, I must say that this car has been extremely reliable and is very well made. At the time, we were looking at used Toyotas for around the $13-14,000 range, but each we found had over 100,000 miles on it. We decided to spend an additional $5,000 for the Ford. It was very tough for me as I have never spent that kind of money on a vehicle, but in the end it has been well worth it. If we were to sell the car today, we could get about $9,000 out of it, which is not too shabby for seven years of driving time on a vehicle we spent $18,000 for. Just my two cents. Enjoy that truck! I am sure it will be quite useful for country living! Not sure if you have thought about this aspect but at least here in NM having a 4wd f150 has opened up a lot of hiking and exploring opportunities that could never be reached with a car simply because there is not enough ground clearance. I just bought a used 2015 Mazda 5 in March. Technically we could have paid cash but that would have made our reserves much smaller, so we went with a big down payment and a short term low interest loan from our local credit union. I found the Consumer Reports website super helpful for researching and comparing different models and years. We ended up buying from a dealer in the next state–there aren’t too many used Mazda 5s on the market (and they don’t make them anymore). It was a trade in at a dealership that doesn’t sell Mazdas so they were looking to get rid of it and it was priced very competitively. March seemed to be a good time as people aren’t really looking yet after winter (we are in NH, so technically it was still winter ;)–the same was true of buying our house last year) and there wasn’t any competition. I drove my previous car into the ground but it was still limping along, but another thing to keep in mind is increased costs in terms of gas, insurance, registration, etc. It is definitely worth it to me to have a reliable car, and still cheaper in these respects than brand new, but just something to budget for. If you are going with a loan, I highly recommend checking out a local credit union if possible–their interest rates tend to be lower (and they tend to have better service in general if you are a member, as opposed to big banks). You can often get pre-approved for a loan online and this gives you lots of leverage at the dealership, especially if you have a good credit rating. It helps if you have a specific car in mind with a specific price and know what your down payment will be. My sad old car got a flat tire just before I was going to trade it in for the new one, so I decided to donate it to NHPR instead of paying to get it fixed. My trade-in quote at the dealership was equal to the tax deduction I will receive next year, so it worked out for me. If you don’t have AWD and don’t need it, I still highly recommend snow tires for the winter if you live in even a slightly snowy area. Consumer Reports ran tests and snow tires trump AWD alone every time (obviously AWD can be necessary depending on where you live!). I have to get to work in all kinds of weather so it is worth the investment for me, and it is great peace of mind to have them on one of our vehicles for other situations. Also, this certainly isn’t an excuse to spend more money, but I was able to get a nicer model than I would have if we purchased new (Grand Touring vs. the base model). It just worked out that way that the vehicle had everything I wanted and happened to be Grand Touring, but it’s a nice positive! Just another random thought: purchase the vehicle that works for your family/situation–you do not have to be the person who transports all the kids! Toyota are the bomb! We have a 2004 Echo with 290 000 km (180 000 miles) on it and it keeps going without much repairs! Bought a new hybrid car because I thought it was safer and better for the environment. The opportunity is potentially huge because it’s taking investment dollars away and they’ll never be compounded. With as much as I currently drive and thus the likelihood of accidents the extra safety aspect could end up saving lives (we get in an accident and survive). Or at least allow me and my family to work/invest longer (we get in an accident but are not impaired)… being a much better investment than if I had an extra $10k-$15k to invest. Do you just withdraw funds out of your index fund investments to pay for this or do you have a seperate “car replacement fund” that you save, invest and spend with? Dumb question: wouldn’t it be more frugal in the long run keeping living in the city? AFAIK, transportation + lodging is kinda constant for neighborhoods of the same “quality”, so living closer is actually cheaper, since while your cost of dwelling offsets the savings on transportation, the time savings of being close to everything make the city the winning proposition. Yep, living in the city would’ve been cheaper. Check out this post for the full explanation: City vs. Country: Which Is Cheaper? The Ultimate Cost Of Living Showdown.